One of the things I love about amateur radio is the fact that there are so many facets to the hobby that there’s always something new to try. At the meeting of the Colchester Radio Club last month there was a talk by Kevan, 2E0WMG about operating portable with lots of photographs of him operating portable stations set up out and about all over the place. This intrigued me and I liked the fact that it seemed really simple to throw a portable station up somewhere and play radio. I’ve exchanged a few emails with Kevan since that meeting and have spent just a few quid on some bits and pieces and I had a chance this weekend to try something out. I did all this in the back garden as I don’t yet have a wireless suitable for taking out portable. 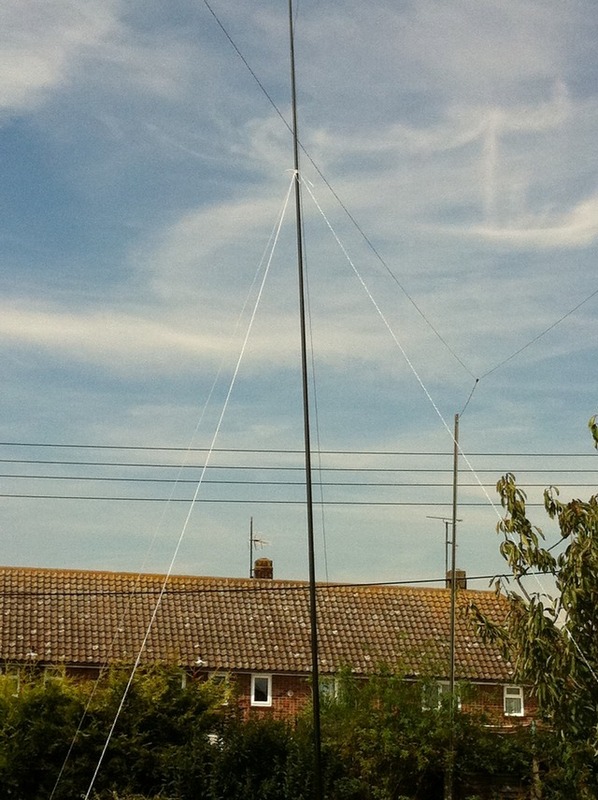 That’s a “10m Telescopic Fibreglass Pole For Flags & Windsocks” that I picked up cheaply from eBay guyed approximately two thirds of the way up and with a 40m 1/4 wave vertical taped to the mast itself. You can see my 40m delta loop as well. I must point out that although the power cables in the background look quite close, that’s perspective. The mast is far enough away so as to be clear from the cables and it’s also clear of the delta loop. The pole is supported at the ground by a rather dangerous looking piece of equipment from Maplin called an Earth Anchor and that can be seen in the following picture. The earth anchor simply screws into the ground to provide a good solid base for the pole. I also wound an “ugly balun” around a soft drink bottle to prevent any RF from leaking back into the coax feed and radiating. You can see the black aerial element heading up the pole and the four red earth wires going off to the sides. I used Kevan’s suggested method of banana plugs to fix everything together and that can be seen in closer detail here. There’s a little coax tail there with two banana plugs hanging off the end. The centre point of the feed goes up the mast and the outer connects to the ground radial wires through these banana plugs. Although this works and the banana plugs stack nice and easily I’m not really keen on it and will look into other options. 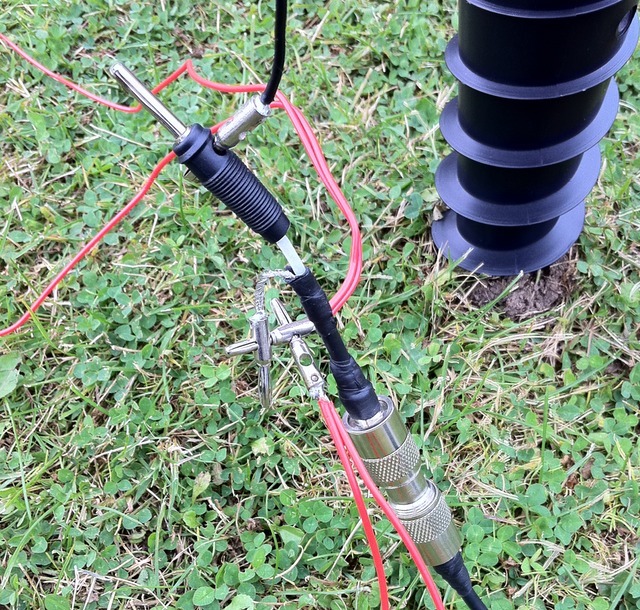 I made two sets of aerials and ground radials, one for 40m and the other for 20m, both being quarterwaves. It took a few attempts to get the tuning right and I quickly learned how simple it is to raise and lower the mast for trimming the wire. In the end I had two nicely matched aerials which gave me a low SWR over each of the two bands. 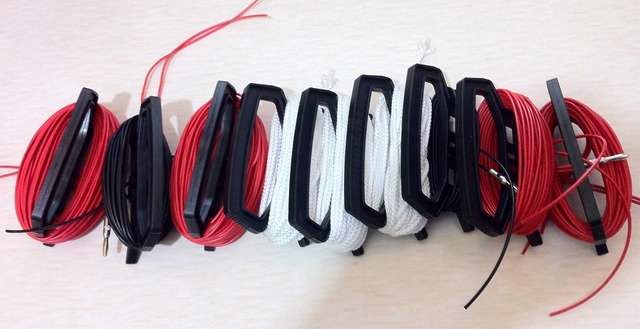 These aerials and ground radials are quickly wound up and stored on kite winders which I bought very cheaply online from kite-warehouse.co.uk. They’re also ideal for storing the support guys for the pole. From left to right, the 40m 1/4 wave and radials, the guy ropes, the 20m 1/4 wave and radials. Once these were all tuned up it was time to try them out. This weekend was a big HF contest, SSB Field Day which I knew would give me lots of strong signals to listen to and test the performance of the verticals in comparison to my 40m delta loop. On 20m, signals were generally around the same strength or perhaps a little stronger by half an S-point or so on the vertical but on 40m, my delta loop always gave stronger signals. I didn’t hear or work any real DX on either band this weekend with either my delta loop or the verticals which was disappointing. The coax to the vertical was a long run though, I reckon that including the choke I was using around 40m of UR43 as opposed to 15m of RG213 to the delta loop. Obviously when working portable for real, this coax run would be a lot shorter. One very interesting and unexpected thing was noticed though and that was that band noise was consistently lower by 1-2 S points on the vertical compared to the delta loop. So all in all I’ve had a fun weekend. I’ve got myself a simple portable aerial setup which can be erected quickly and easily by a single person and which works. It needs tweaking but it’s a good start and I enjoyed myself. 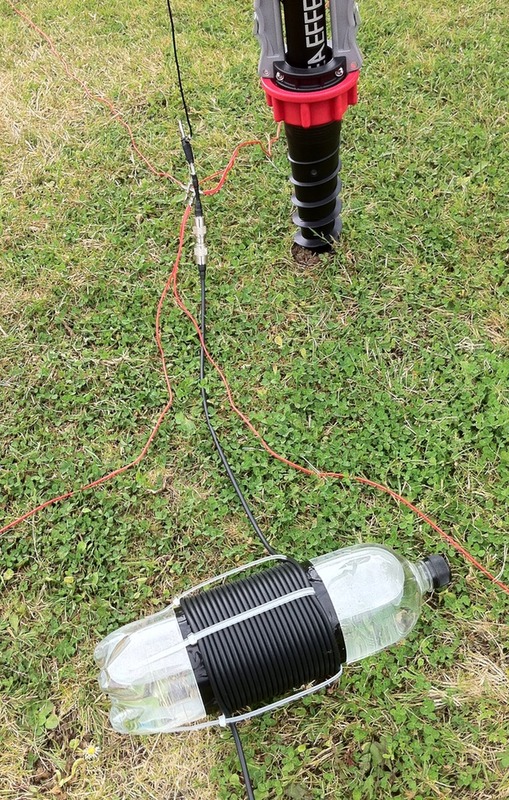 This entry was posted in Amateur radio, Construction, HF and tagged Delta Loop, Earth Anchor. Bookmark the permalink. Thanks Rob, I’ll take a look at that. The reason for using a choke balun at home was more because I knew I’d have a long run of cable snaking through the house. I’d hope to be sitting somewhat closer to the aerial when out portable so probably wouldn’t bother with one.